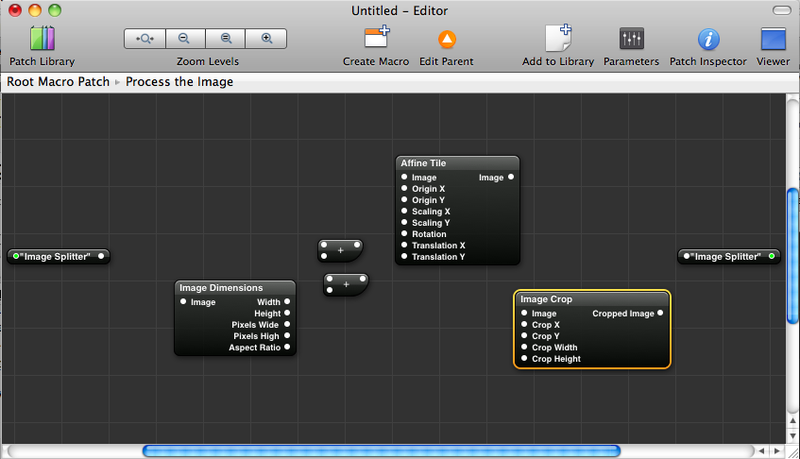 In this blog, I’ll show how to create an Offset filter for Pixelmator using Quartz Composer on Mac OS/X Snow Leopard. 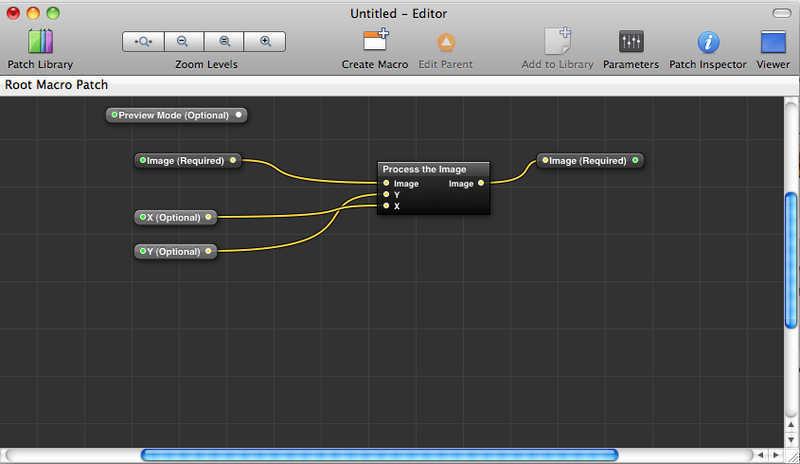 Pixelmator is a really cool image editor and a great, low-price alternative to Photoshop. Pixelmater is not quite so feature rich as Photoshop and one its the missing feature is the Offset filter. This filter is used a lot when creating tileable textures without visible seams. This filter is extremely simple: It simply tiles the layer and move the layer in one direction. It is possible to achieve the same effect manually, by creating 4 copies of the layer, moving them to the 4 corners and finally merging the layers. However this approach is both error prone and cumbersome. 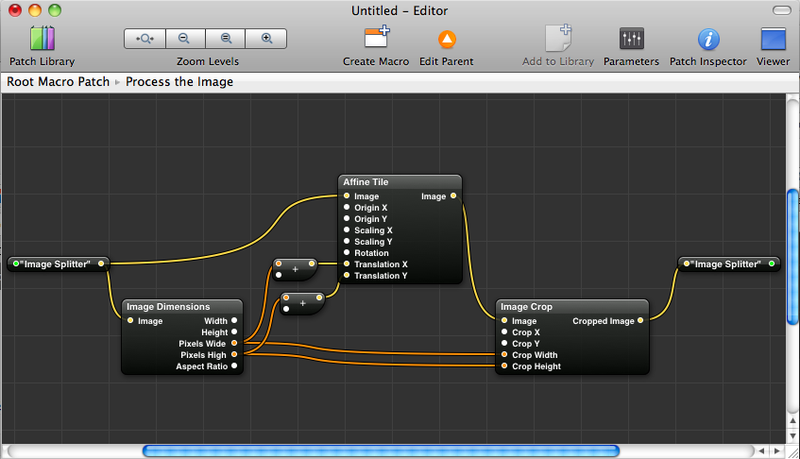 Pixelmater does not support scripting, macros or plugins, but it does supports Quartz image filters. Quartz filters is a part of OS/X and defines filters and effects that can be used by applications of the platform. 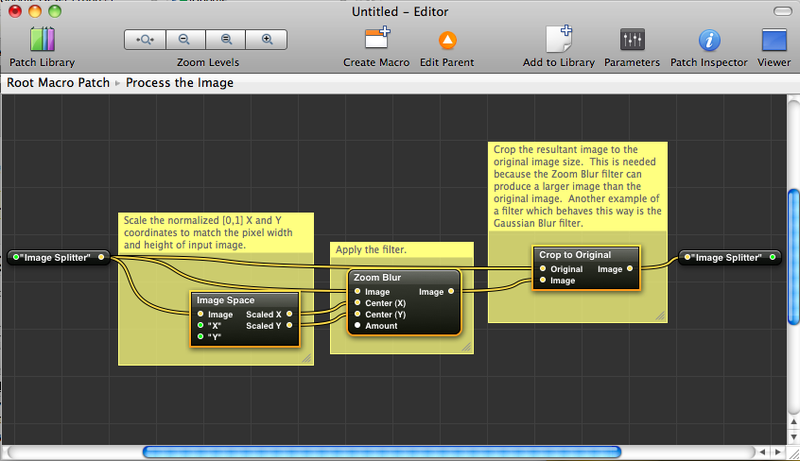 In the following section I’ll show how to create the filter in Quartz Composer. If the implementation does not have your interest, then skip the section and go to the section ‘Installing the Offset Quartz filter’. The first step to create a new Quartz filter is to launch the Quartz Composer. This program is a part of the developer tools and it located here (under Snow Leopard): /Developer/Applications/Quartz Composer.app. If you cannot locate the program, you may need to install the developer tools from the OS/X install disk. Library: shows you available functions you can use in your filter. Now you might wonder how the black box in the middle (‘Process the image’) works. To find out, double click on the lower part of box (not the bullets or title) – this will open the container (also called macro patch). Now delete the three middle patches (Image Space, Zoom Blur and Crop to Original) by left click and delete-key. Also delete the notes by right-click and select delete from menu. Notice that the viewer will turn black when you delete the component. We need to change the math operation from + to x (multiplication). To do this, you can double left-click on the + and select x (multiplication). Do this for both math components. We now need to assign a second input to the two math operations. Right-click on each math component and select ‘Publish Inputs’ -> ‘Operand #1’. In the textbox write X for the upper math component and Y for the lower math component. Now we are done! To test the filter click the ‘Parameters’ button from the top menu and try to change the Input X and Input Y values. This should result in the offset effect in the viewer. Now save your filter to any location on your harddrive. To install a quartz filter you need to copy the qtz file into the folder /System/Library/Compositions /Library/Compositions (edited 23 okt. thanks to Antony for pointing this out). Since this is a system folder, you may be asked for permission to install the filter. 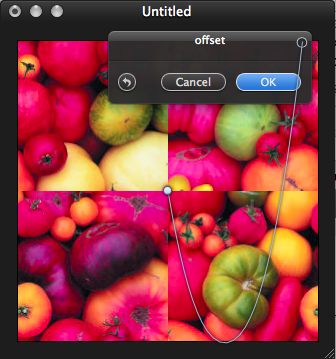 For a more advanced offset filter, checkout the OffsetAdvanced filter. I’m Antony from the Pixelmator forum. Nice filter. I would like to pass on some words of advice. Apple advise against putting filters in the system path. (I believe the reason behind this is that they could get deleted on a system update). The recommended path is MACINTOSH HD > LIBRARY > COMPOSITIONS. This still requires admin access and as with the system folder, the filters are available to all users. Also, if you have the time, it is a nice touch to package the filter (or filters) and have it automatically install them in the correct location. The Packager is located in DEVELOPER > APPLICATIONS > UTILITIES. I would be happy to offer assistance on how to use this if you wish to use it. You can contact me on the Pixelmator forum via this thread http://www.pixelmator.com/support/viewtopic.php?t=3403&postdays=0&postorder=asc&start=30 . It is handy to include this link in your filter post just in case users wish to comment about your filter on the forum. Thanks for the feedback. I have updated the blog post with the correct path, and created a installer package. Fantastic! Thank you very much for sharing. This was an important missing feature in Pixelmator. Interesting how you made it. Great work! I’ll be referencing you when I make a tutorial on seamless textures, definitely. Big cheers and thanks again! I know this is old, but maybe you can tell me why when I use the filter in Pixelmator, I see the flower image from Quartz when i try to move the filter. Thanks for the ofset plugin, works great. I am struggling to workout/find on the www how to then simply tile repeat this image to create wall paper. I used this a while back and went to use it again just not, but it doesn’t show up in my effects anymore. Is there a reason this is so? I tried reinstalling, but nothing.